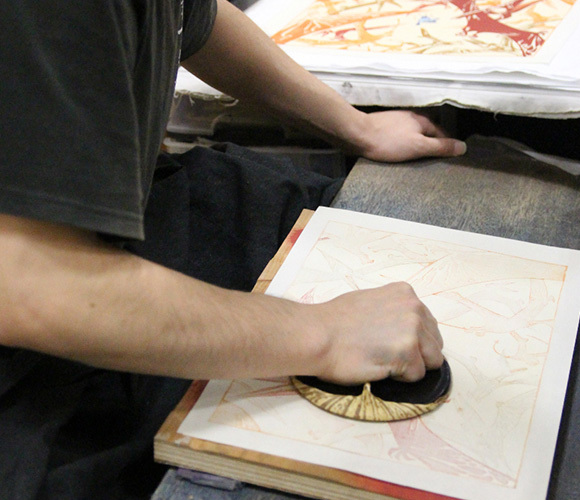 The "Homage to Ukiyoe" project, first exhibited as part of the Tokyo Design Week in Milano Salone 2015, enabled six of the world's most renowned comtemporary artists and designers to become ukiyo-e (traditional Japanese woodcut print) artists. 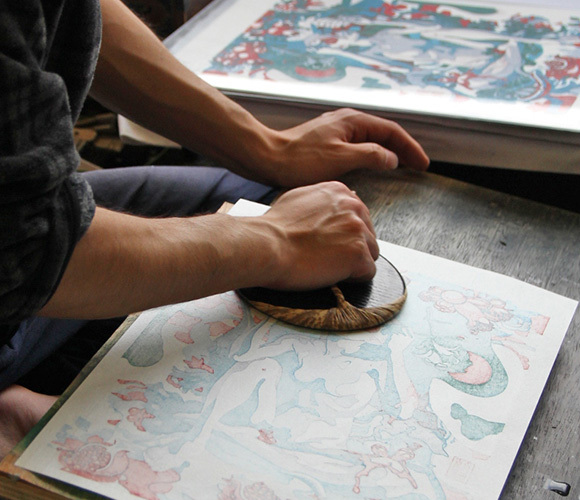 Collaborating with the carvers and printers of the Adachi Institute of Woodcut Prints, and guided by the "Homage to Ukiyoe" theme, these currently active creators produced contemporary ukiyo-e expressing their own individual interpretations of the woodcut prints of Japan's Edo period (1603–1867) that influenced Van Gogh and Monet. 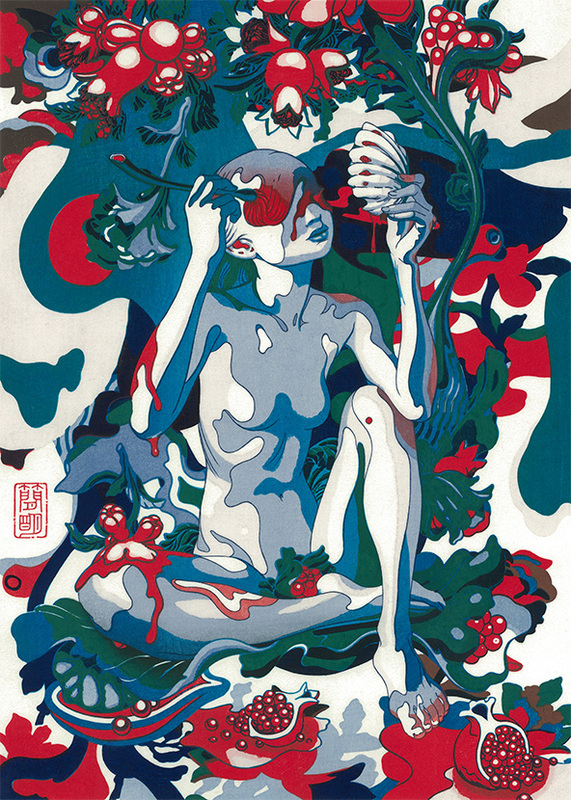 The participating creators included Dan Schlesinger, who is famous for creating the cover art for the Japanese edition of the Harry Potter series, and James Jean, who has designed artwork for Prada. 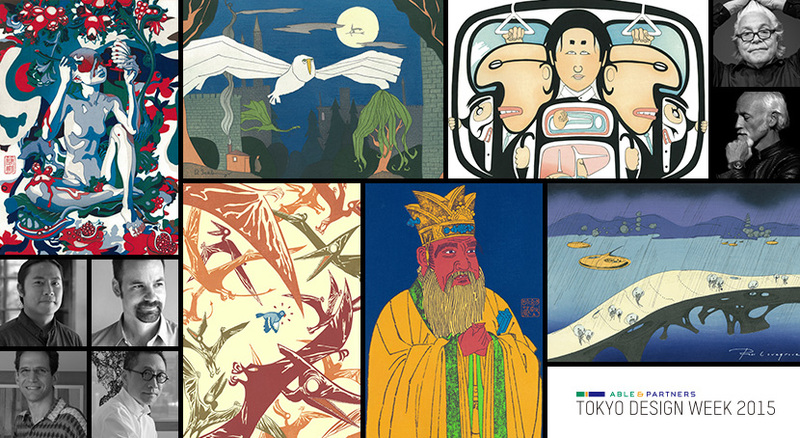 The "Homage to Ukiyoe" project was originally conceived as part of Tokyo Design Week, a design festival held in Tokyo's Jingu Gaien area annually for the past 30 years. 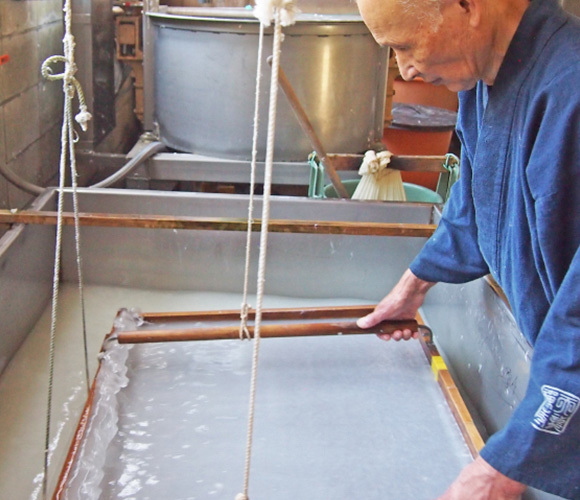 This design festival was featured at the Milano Salone del Mobile in April 2015, where the contemporary ukiyo-e were first unveiled to great acclaim. 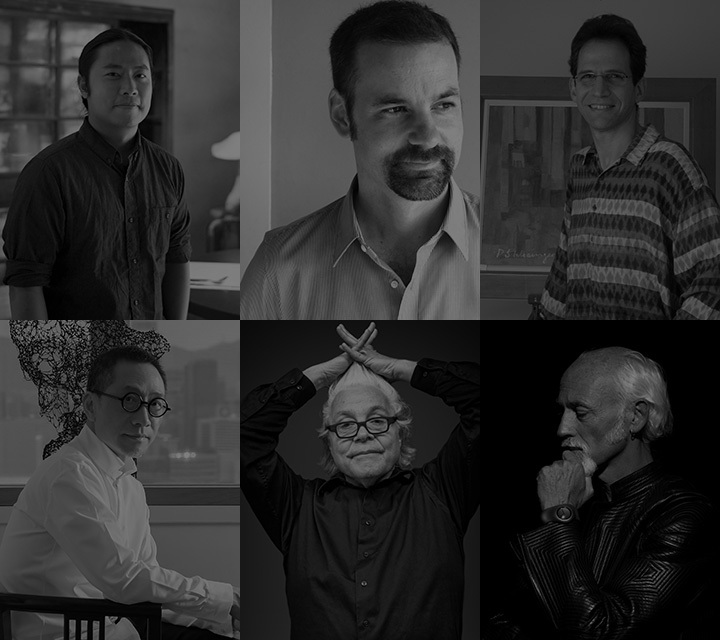 The exhibition marking their triumphal return to Japan is open for viewing during the main Tokyo Design Week 2015 from October 24 to November 3. The young woman's gestures are exactly as though she were looking in a mirror to apply her makeup. 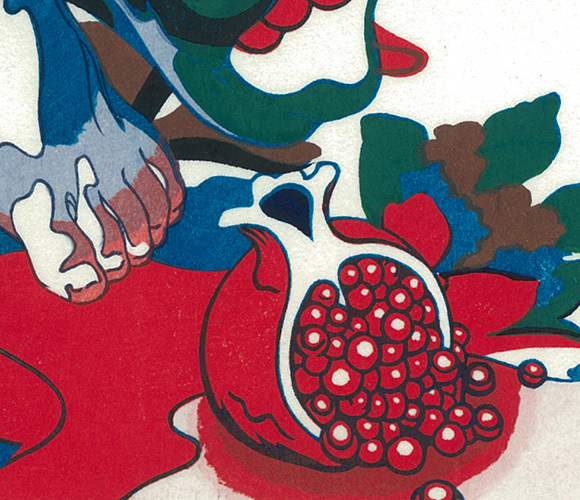 The pomegranate is venerated as a symbol of abundance due to its profusion of seeds. 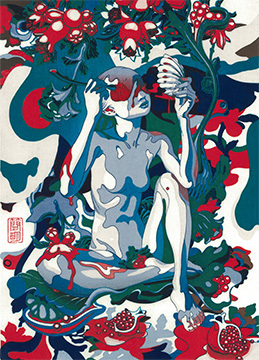 Born in Taiwan in 1979, Jean currently lives in Los Angeles. 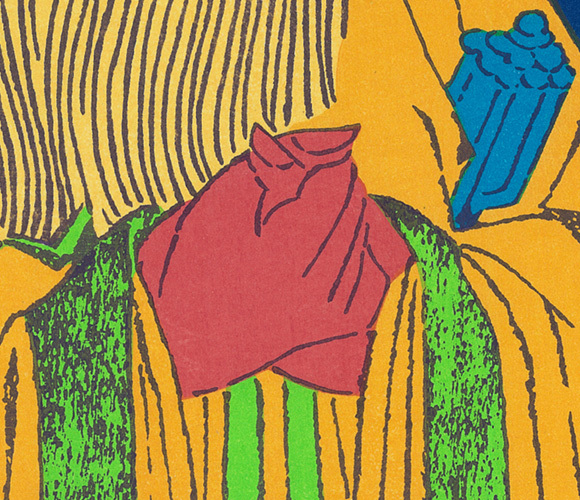 After graduating from New York's School of Visual Arts, Jean won numerous awards for his cover art for American comics, including 7 Eisner Awards, the United States' most authoritative award for comics. 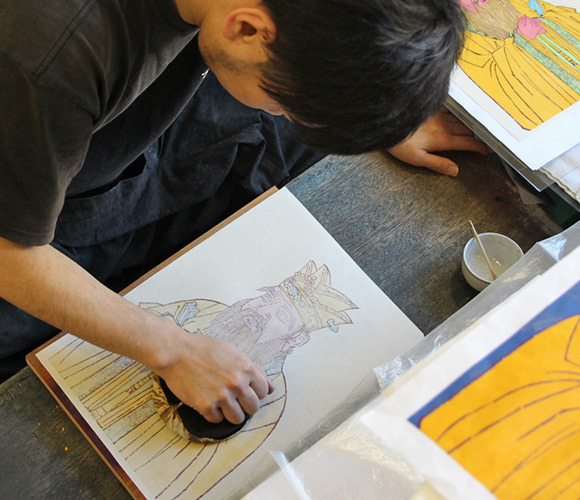 In 2008, he collaborated with Prada in a global campaign that included fabric prints, installations, and an animated film. 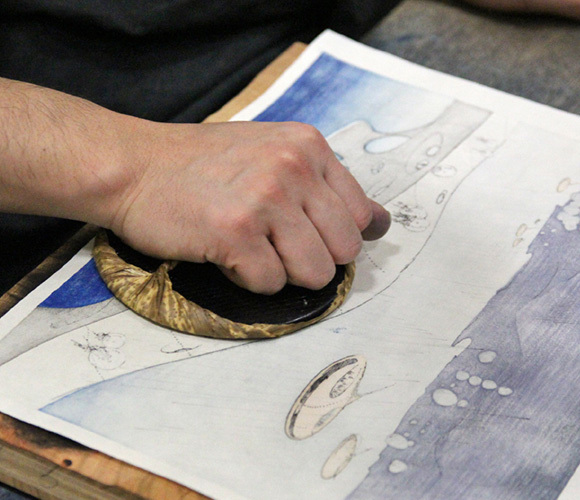 The world renowned contemporary Japanese artist Takashi Murakami has shown an interest in his work, and September 2015 saw the launch of his first book of original art published in Japan (titled Pareidolia). 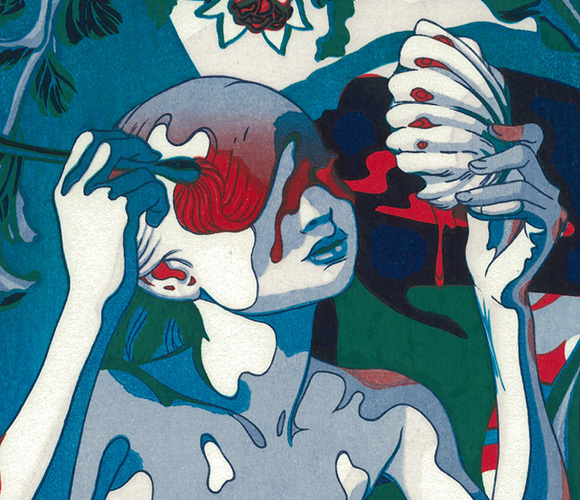 The print portrays a young woman using the red color dripping from a pomegranate as makeup. 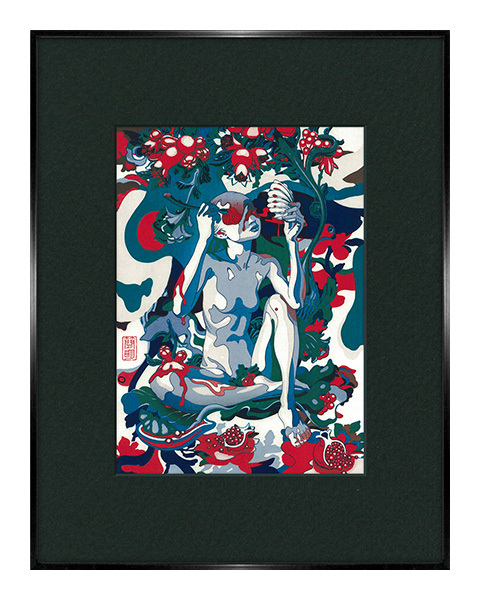 She appears to be trying to envelop herself in the powerful vitality and striking appearance inherent in the pomegranate's abundance and fertility. 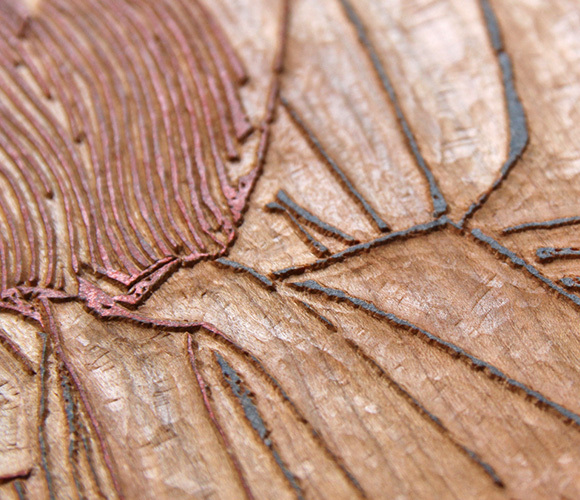 The work makes the most of the vivid coloring that is a unique feature of woodcut prints to feature eye-catching contrasts of color. 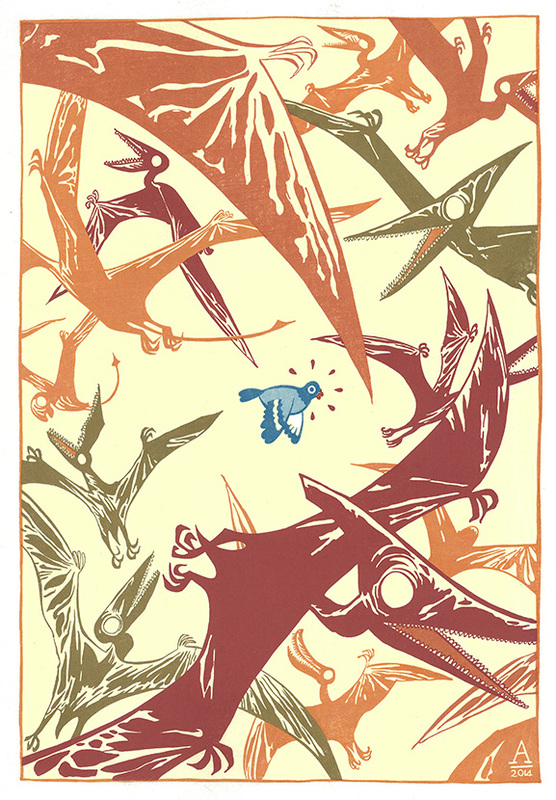 TOKYO DESIGN WEEK Co. Ltd.
A comical touch is used to depict the little bird that has strayed into the flock of pteranodon. 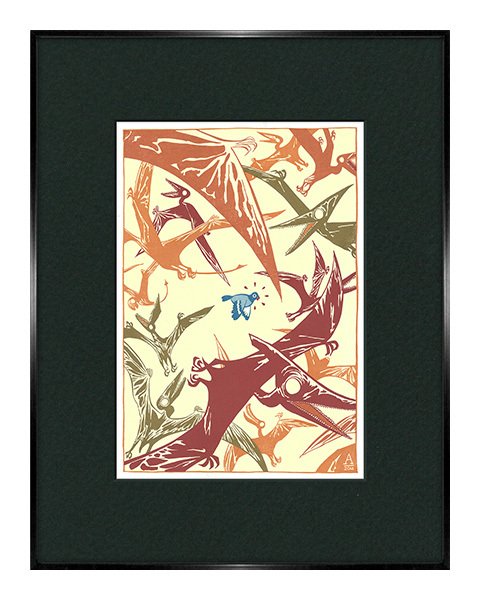 The pteranodon fill up most of the picture, flying around with their wings spread wide. 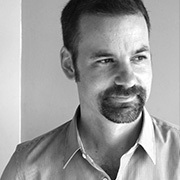 Born in France, Puvilland now lives in San Francisco. 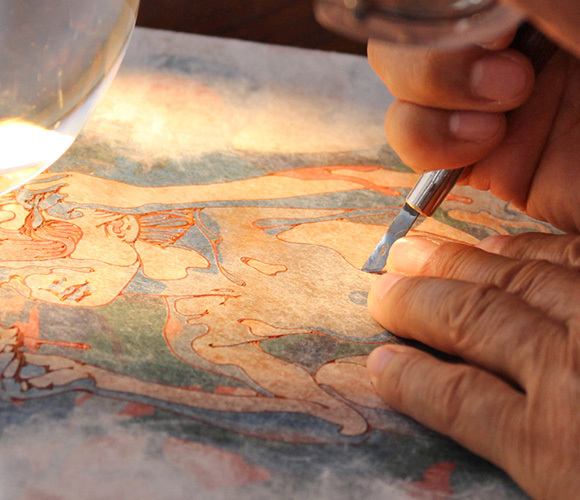 He was involved in the production of popular animations for DreamWorks Animation, including Shrek 2 and Madagascar. 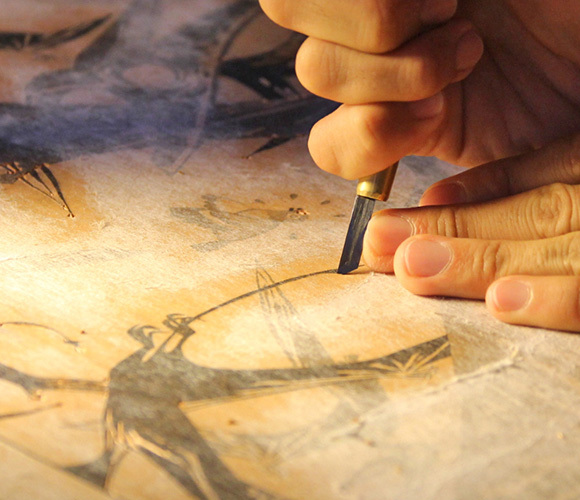 He has also worked on the illustrations for graphic novels, including one based on the globally acclaimed game Prince of Persia. 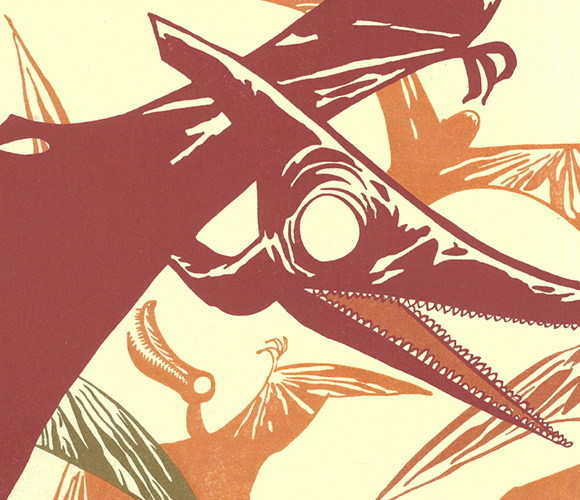 Created by an artist active in the world of animation, the print conjures up a tale of adventure, depicting a little bird that has strayed into the world of the dinosaurs. 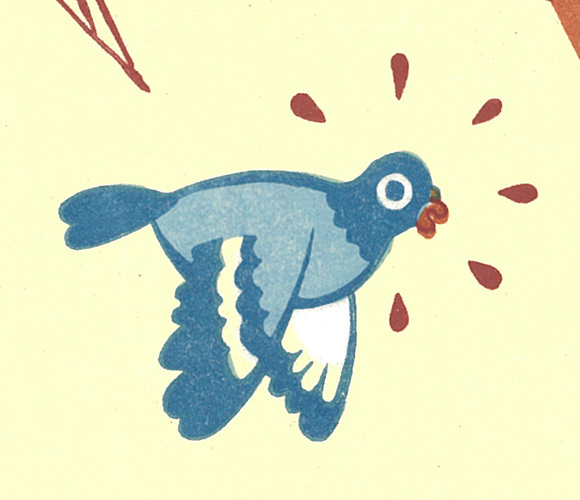 The bright colors and soft texture unique to woodcut prints enhance the charm of a work that conveys an innocent humor. 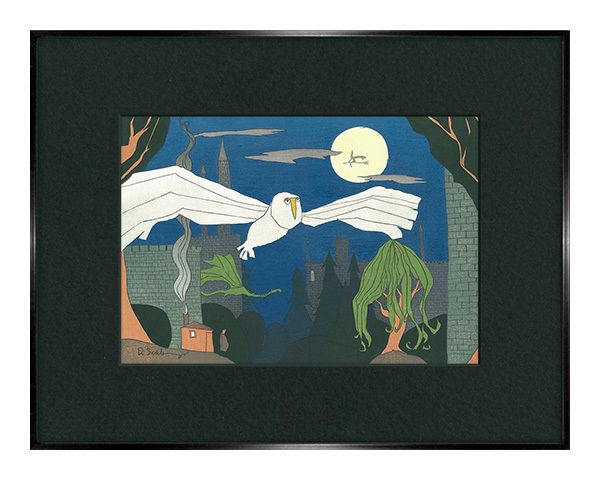 The print is characterized by the snowy owl evoking the world of Harry Potter. 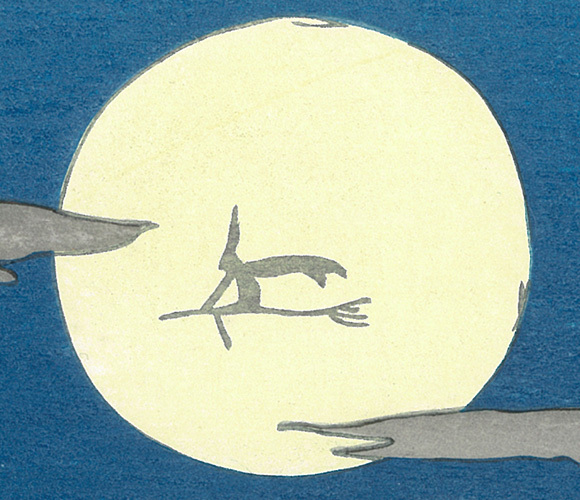 A witch's silhouette can be seen in the full moon that shines bright against the night sky. 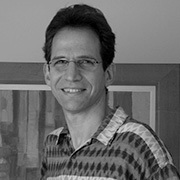 Born in the United States in 1955, Schlesinger currently lives in the United Kingdom. After graduating from Yale University, he studied law at the universities of Oxford and Harvard. 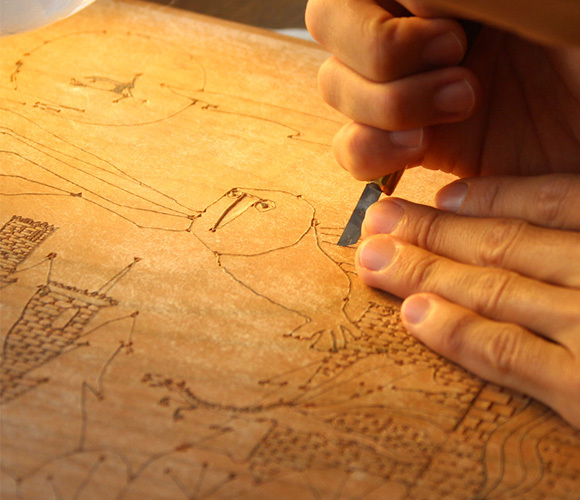 Some time later, a work of art he produced at the request of a designer friend met with an extremely positive public response, prompting him to retire from the law to become an artist. 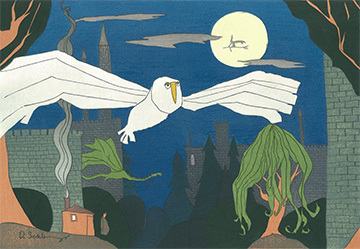 In 1999 he gained popularity in Japan when he created the illustrations for the cover and frontispiece of the Japanese-language edition of Harry Potter and the Sorcerer's Stone. 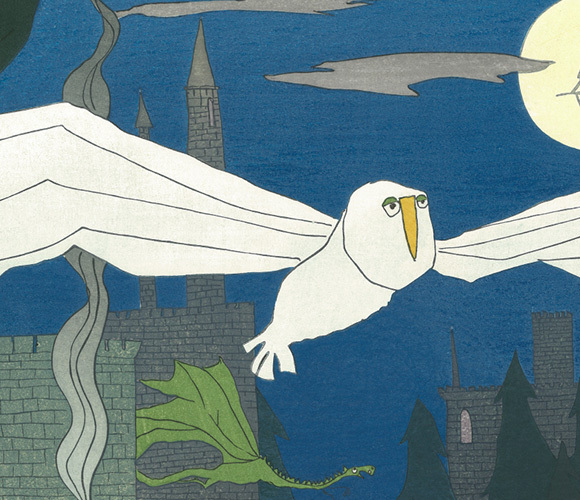 A distinctive, sharp-lined style is used to depict Hedwig, the snowy owl that appears in the Harry Potter series, with her wings spread wide across the night sky. In the background are scattered motifs symbolizing the world of Harry Potter, such as the Hogwarts School of Witchcraft and Wizardry and a witch on a broomstick. The overall effect is like wandering into the world of the Harry Potter stories. 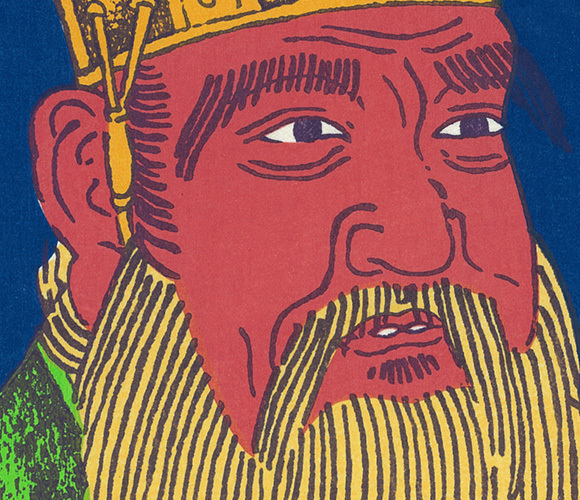 The two front teeth in this portrait of Confucius are depicted as a single tooth, a feature which is believed to be characteristic of sainthood. 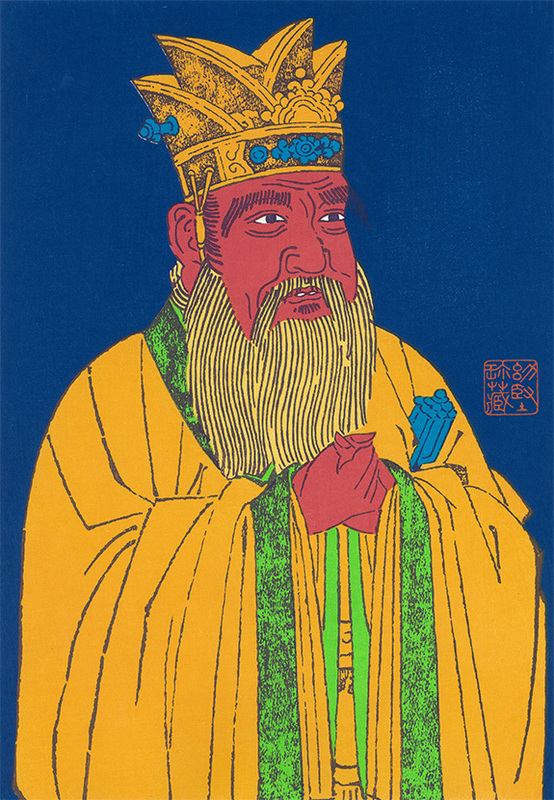 In ancient China, bowing with both hands folded together in front of the chest was believed to represent lack of hostility toward another. 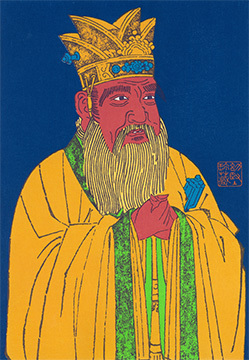 Chan was born in Hong Kong in 1950. 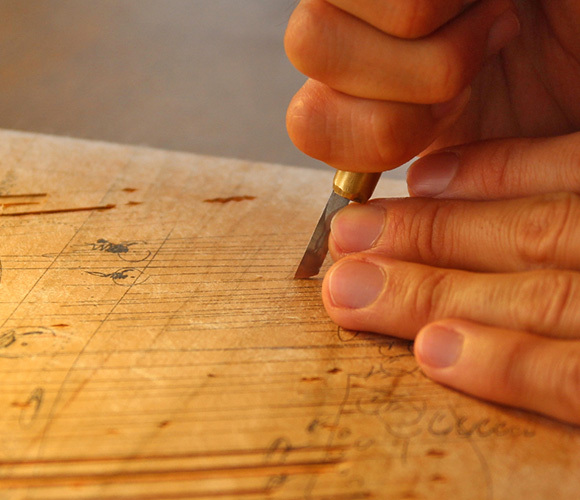 Following 10 years working in an advertising agency, he taught himself design. 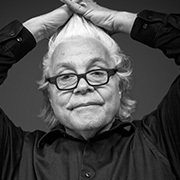 In 1980 he set up his own company and went on to work in a wide range of fields, including corporate logos and product design. 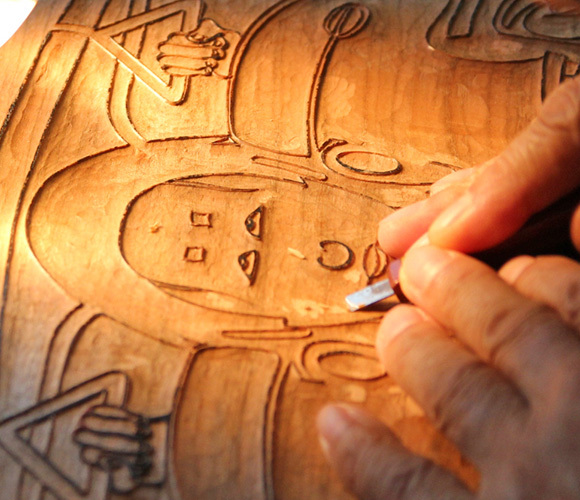 As one of few internationally recognized designers from Hong Kong, Chan has embraced the concept of "East meets West." 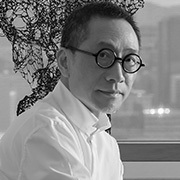 His work includes logo design for the Sumitomo Mitsui Banking Corporation and Japanese furniture and homeware store Francfranc. 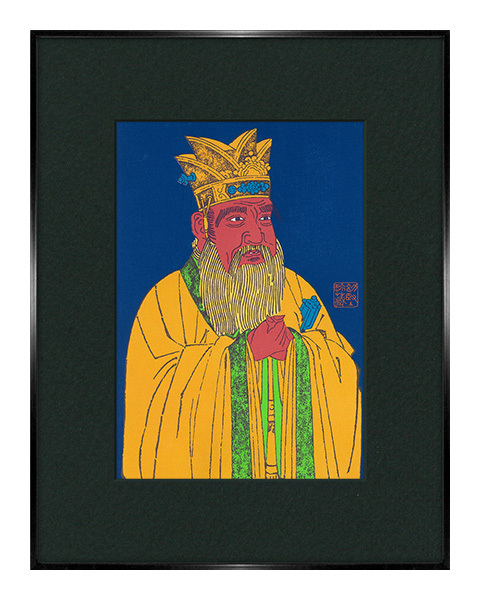 The print depicts China's iconic philosopher, Confucius. 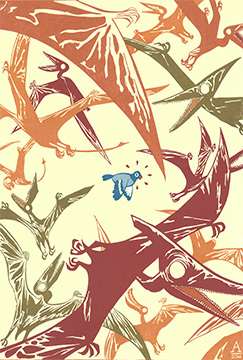 The artist's own unique style is apparent in the way he draws on a contemporary aesthetic to bring new perspective to the conventional motifs, while respecting the meanings inherent in traditional representations of the philosopher. 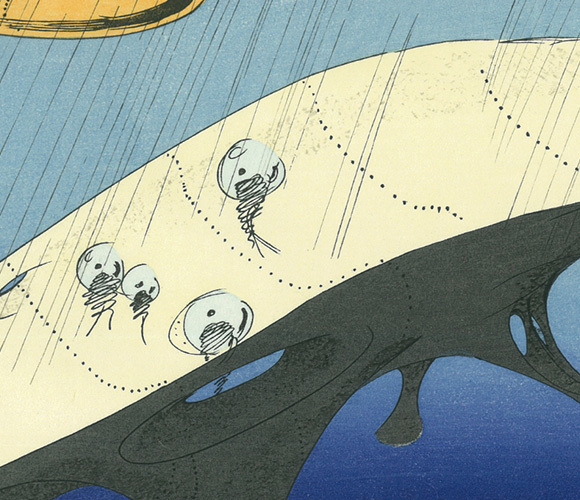 In this work the artist has sought to define what culture is by tracing the roots of Japanese ukiyo-e, which developed out of printing technology introduced to Japan from China. The facial expressions are striking, being reminiscent of Noh masks. 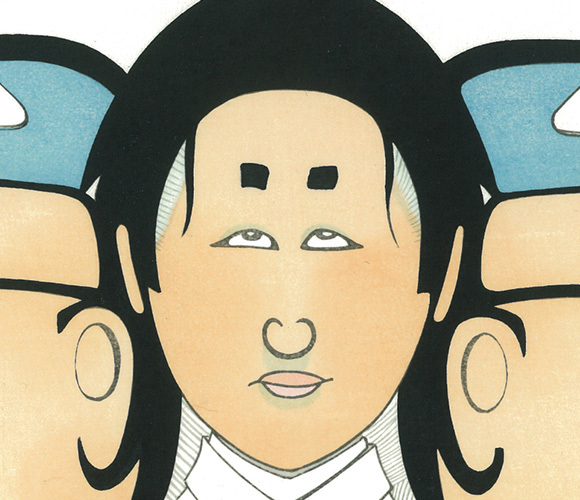 Two "salarymen" with the same face are positioned symmetrically. 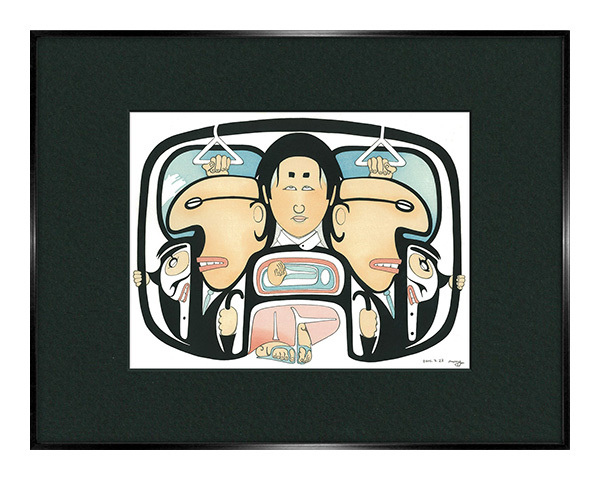 Yahgulanaas was born in 1954 on Canada's Haida Gwaii archipelago. 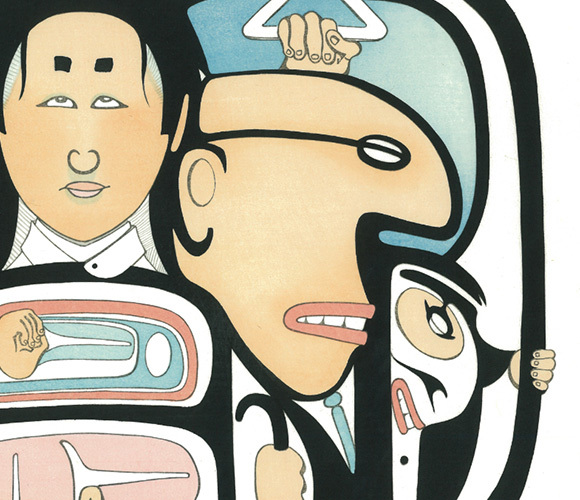 Alongside participating in racial politics on behalf of Canada's indigenous Haida people, he is active as an artist across a wide range of Haida art forms, including songs, dancing, sculpture, painting, and drawing. 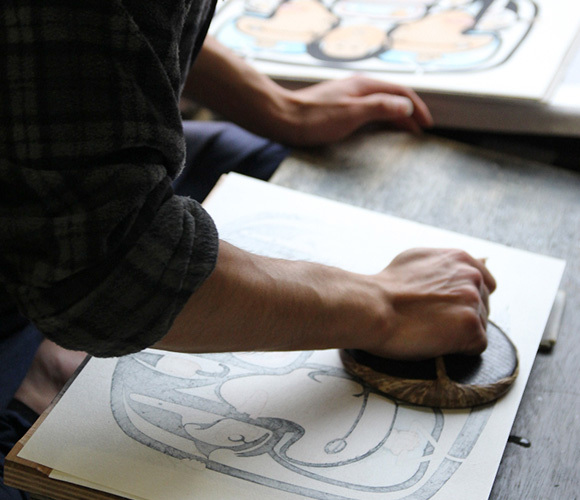 Over time, he established his own expressive style called Haida Manga, which fused the Japanese manga style that had influenced him with the traditional arts of the Haida people. 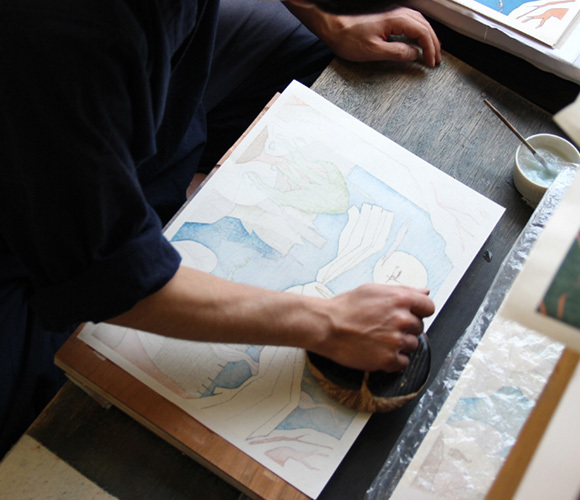 He has exhibited works in many countries worldwide. 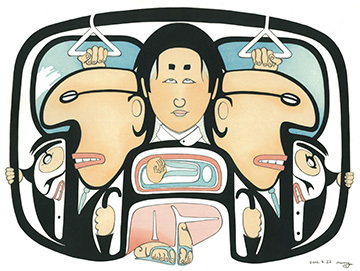 The scene inside a rush-hour train is illustrated within a decorative border delineated using the traditional techniques of Canada's indigenous Haida people. 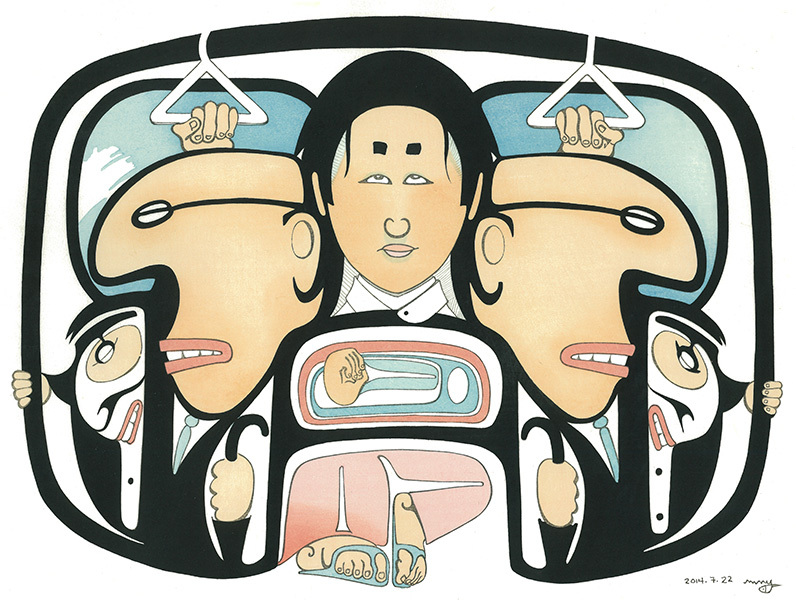 Two "salarymen" are portrayed symmetrically to the right and left, their uniform appearances and Noh mask-like facial expressions incisively satirizing modern society. People from the near future come and go across the large bridge that runs diagonally across the picture as if to intersect it. 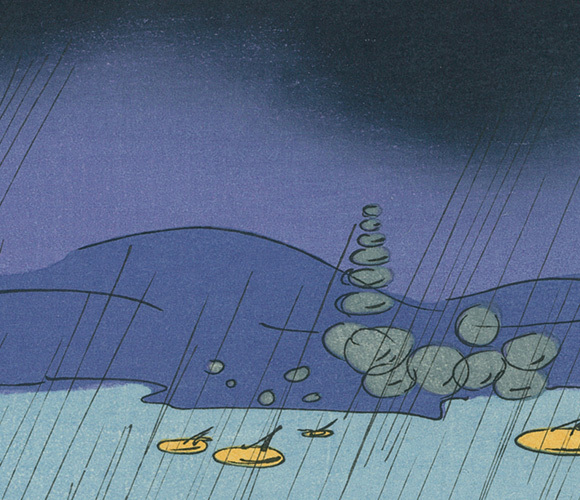 Rain pours down from the rainclouds, which are printed using the ukiyo-e technique known as ate-nashi-bokashi (blurred color gradation). 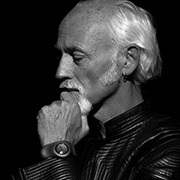 Born in the United Kingdom in 1958, Lovegrove has been working as a designer since the early 1980s. 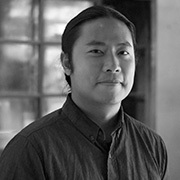 He has won numerous international awards, and secured his position as a designer at the worldwide level in 1998 when he unveiled his elegantly contoured "Go Chair". His work is exhibited in New York at the Museum of Modern Art and the Guggenheim Museum, as well as at the Centre Pompidou in Paris, and elsewhere. 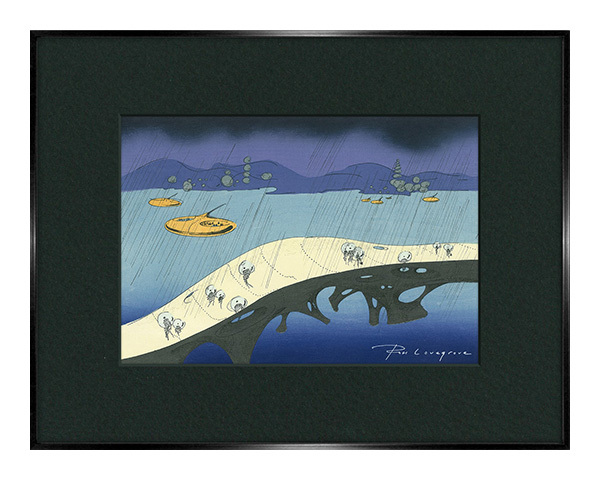 The print is an original interpretation of an image inspired by Utagawa Hiroshige's masterpiece, Sudden Shower over Shin-Ohashi Bridge and Atake.The imposing bridge cutting across the picture appears to connect the present with the future. Over the bridge, which has been "designed" employing Lovegrove's characteristically beautiful curved lines, people wearing clothing representative of the near-future come and go. 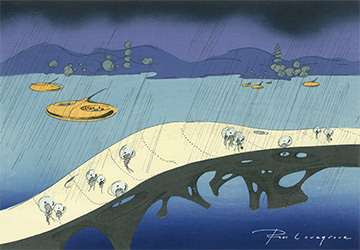 Meanwhile, the clouds and rain in the background are portrayed using traditional ukiyo-e techniques, creating a work that combines the traditional with the contemporary to striking effect.